The fleur-de-lis is a timeless icon that has been used on everything from family crests to sports team logos. But there's more to this symbol than heritage and heraldry. For instance, the color of each fleur de lis carries a special significance. Silver stands for peace and sincerity. Choose these attractive labels if those are virtues you value. Then stick them on your outgoing mail for an eye-catching finishing touch. These labels will also help you rid your life of a little stress. Let them be a time-saving tool as you finishing filling out envelopes. A self-adhesive backing lets you peel, place and move on! 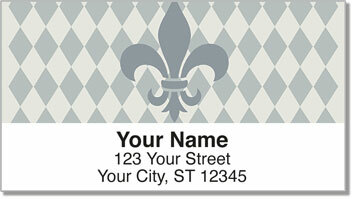 Get your own Silver Fleur de Lis Address Labels now! Order them with a set of matching checks.